James Clapperton was born in Aberdeen in 1968. He studied composition with Philip Grange at Exeter University and Michael Finnissy at Sussex University. His piano tutors were James Avery (Freiburg), Aloys Kontarsky (Cologne) and Yvar Mikhashoff (Buffalo, USA). From 1995-98 he was Composer in Residence at Oxford Brookes University and then moved to Bergen, Norway where he taught at the Grieg Conservatory of Music. At that time he was also the artistic director of the Music Factory Festival in Bergen and invited prominent composers such as Helmut Lachenmann, Horatiu Radulescu and Salvatore Sciarrino to Norway. 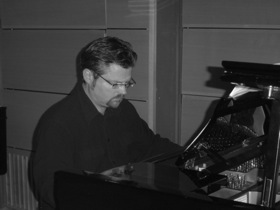 As a composer he has enjoyed collaborations with numerous leading artists and ensembles. In 1993 his violin concerto 'The Preiching of the Swallow' won the PRS Award and was subsequently performed by Maya Ayabushi and the Royal Philharmonic Orchestra. Works by James Clapperton have also been performed and commissioned by Chamber Group of Scotland, Edinburgh String Quartet, Endymion Ensemble, Sharleen Harshenin, Yvar Mikhashoff, Mr McFall's Chamber, Steven Osborne and the Taiwan Chamber Orchestra. In June of this year his orchestral piece 'Songs and Dances of Death' was performed by the BBC Scottish Symphony Orchestra under the baton of Ilan Volkov. He is currently working on commissions for Norwegian National Theatre and the Edinburgh Contemporary Arts Trust.